The oil company British Petroleum has announced it has struck oil in the North Sea. The find will eventually make a huge difference to Britain's balance of payments since almost all of the country's oil is imported. Last year the cost of importing crude and partly refined petroleum was �670m. This discovery follows other finds in the last five years of natural gas as well as oil and suggests the North Sea could become one of the world's major sources of crude oil. The North Sea is divided into UK, German, Norwegian, Danish, and Dutch sectors. The UK has the largest of these sectors. In June BP discovered another major field in the Norwegian section, Ekofisk, that is expected to supply 10% of Britain's oil needs. The new field situated in block 21/10 of the British sector, some 110 miles (177km) east of Aberdeen in Scotland. BP said its exploration well was dug 350ft (106 metres) into the sea bed and produced good quality oil at the rate of about 4,700 barrels a day. Currently oil consumption in Britain is nearly two million barrels a day. This month's find is welcome news for BP which has been hard hit by high costs of transporting oil from its huge oil reserves in the Middle East. The company's shares have risen by 14% in the last two weeks in anticipation of the announcement. But it will take some time - some say up to seven years - to develop the field into a viable oil producer. A pipeline will have to be built on the sea bed from the oil field all the way to the Scottish coast near Aberdeen. Conditions in the North Sea during winter are particularly harsh. Shell-Esso has a drilling rig, Staflo, and sometimes has to evacuate it when winds reach gale force 10 in the region. 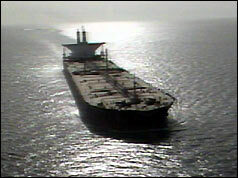 BP began pumping oil from Block 21/10, known as Forties, to the mainland in 1975. At its peak, Forties produced half a million barrels a day, equivalent to 25% of the UK's daily oil needs. Britain's North Sea oil was no rival to that produced by nations in the Organisation of Petroleum Exporting Countries (Opec). But output grew as major discoveries continued throughout the 1980s and into the 1990s that had a dramatic effect on the national and local economy. Britain ended its dependence on oil imports which improved the balance of payments while life for the people of north-east Scotland was transformed. The dangers of extracting oil at sea was underlined in 1988 with the tragic accident of the Piper Alpha platform. In April 2003 BP sold Forties to independent oil producer Apache.